FREE Lock, FREE Gloves & FREE Helmet with Purchase_$199-Value! 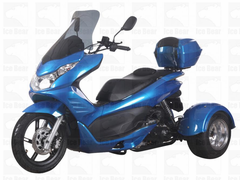 A great looking Trike and top features like electric start, aluminum rims and cool colors combine to make the Ace 50cc trike a really fun ride! The 3 wheeled Ace trike scooter features a sport styled hard wearing ABS body and oversize seating for two riders. Heavy-duty welded steel frame is able to carry up to 308 pounds and can tow up to 66 pounds. A FREE cargo trunk is included. Street legal, the Q6 50cc is perfect for running around town or just a fun ride. Differential rear axle gearing, front and rear hydraulic disc brakes, hydraulic suspension and automatic CVT transmission make riding the ACE smooth and easy. The powerful 50cc 4-stroke engine provides plenty of power and great fuel economy! Dash mounted speedometer and fuel gauges, handlebar mounted rear view mirrors and a 31 inch seat height provides a comfortable ride. Available in several color choices. GET ALL THE FOLLOWING FREE WITH SCOOTER PURCHASE! a $177 value with ,ost Scooter Purchase! Many States do not require a motorcycle license, registration or insurance for Mopeds /scooters under 50cc. Please check with your local DMV or a licensing place for detail. Top speed of 35 mph, this trike is perfect daily transportation on the city roads. It is easier to ride and offers more safety features than a 2-wheel scooter or motorcycle. At up to 80+ MPG this model is very affordable to operate and maintain.